In 1934, the company that would become the world renown KTM was born. Austrian engineer Hans Trunkenpolz initially opened the business as a metalworking shop. When sales were on a steady decline, Trunkenpolz decided to carve out a place for the shop in motorcycle manufacturing. In 1951, they produced the R100, their first cycle. A respected businessman and entrepreneur, Ernst Kronreif, bought a very large share of what was called Kraftfahrzeuge Trunkenpolz Mattighofen. With Kronreif's investment into the company, it was renamed to Kronreif, Trunkenpolz, Mattighofen in 1953, also known as KTM. In the time since the 1950s, KTM has become an established name in American motorsports, known for their powerful line of racing motorcycles and dirt bikes. 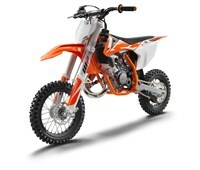 We are honored to carry KTM OEM parts for their motorcycles and dirt bikes. No matter what parts you need, we've got them here in our full-scope inventory. If you're the owner of a KTM bike from the 1990s, we've got all the right OEM parts to get your dirt bike up and running as smoothly as the day you bought it. With OEM parts, you're purchasing pieces made by KTM for your specific bike, so you're guaranteed to get a perfect fit. Whether you ride a 125 EGS, 620 Duke, or 640 Adventure, we stock the parts you require to get on the street or offroad once again. From crankshafts and starter engines, to stands and attachments, we have everything your specific KTM bike needs. If your KTM dirt bike is a 2000s model, we've got a wide-ranging inventory of parts for these models as well. We've got it all, with KTM OEM parts for models spanning from 2000 to the most current options. Whatever you need, you can find it here. From clutches and brakes, to wheels and frames, you will easily be able to find all the specific parts for your KTM bike. Whether you own a KTM 125 EXC, 690 Duke, 50 SX, or 660 Rallye, we stock KTM OEM parts for the inner and outer workings of all models to get yours out of the garage and running full speed ahead. If you know exactly which KTM OEM part you're searching for, you can find it instantly using our OEM Part Search. Simply enter in the part number and model name, and your search will yield the part you need. With KTM Parts Nation, it really is that easy! KTM is a trusted and respected name in the motorsports industry that produces some of the best motorcycles and dirt bikes in the world. No matter which model you own, we've got the right KTM OEM parts to match your bike to get those wheels spinning once more. Find them today!